Introduction: Esophagogastric anastomosis ischemic events have a reported incidence of 3.2% resulting in leaks and necrosis. Gastric Conditioning (GC) has been proposed to reduce such morbidity. Unfortunately this exposes a debilitated patient to 2 operative procedures and is carried out 2-3 weeks prior to esophagectomy. We propose that with meticulous laparoscopic dissection, GC is not needed, saving time, money, and decreasing patient morbidity. Method: A retrospective study of 19 consecutive laparoscopic esophagectomies (LE)(13m/6f) done at a single setting without preoperative GC. Leak rates, conduit necrosis, and 30 day mortality rates were evaluated. Leaks were evaluated with either an esophagram or CT scan on post operative day 6. Each esophagectomy was carried out via the 3 field technique (neck dissection, thorocoscopic mobilization and node dissection, and laparoscopic conduit mobilization) and the non-tubularized stomach was used as a conduit in all 19 cases. The left gastric artery (LGA) was ligated during the primary and only procedure. Cervical esophgogastrostomy was constructed using a partially stapled technique. Results: The leak rate was 0%, necrosis of the gastric conduit was 0%, and the 30 day mortality was 0%. There were no neck wound infections. All 19 patients were discharged home on oral intake. Conclusion: The use of GC does not appear to influence the leak rate, conduit necrosis, or mortality rate for minimally invasive esophagectomy. By not doing a GC procedure, we have offered debilitated patients status post neoadjuvant therapy the opportunity to have a minimally invasive approach to esophageal resection as a one stage procedure. This has resulted in decrease exposure of the patient to possibly increased morbidity. 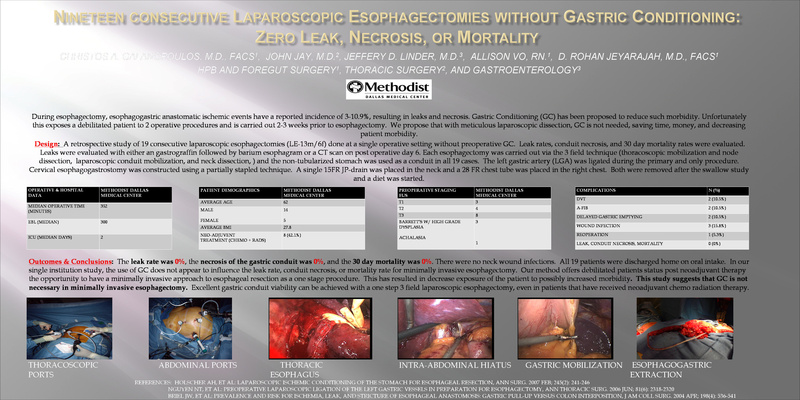 This study suggests that GC is not necessary in minimally invasive esophagectomy. Excellent gastric conduit viability can be achieved with a one step esophagectomy, even in patients that have received neoadjuvant radiation therapy.